The Furniss Mine is located in Cabarrus County on the eastward side of Miami Church Road about four miles from the road's intersection with US 601S. The mine adjoins on the south and north with the property known as the Phoenix Mine, now Green Oaks Golf Course. The Phoenix-Furniss vein systems traverse both properties and mining operations at the Furniss have been largely confined to northeasterly extensions of the veins worked at the Phoenix. Although no discovery date for gold on either property has been established, it is documented that on July 16, 1832, James Anderson deeded to David Storke and seven partners a fifty- two acre tract of land that was to become the Phoenix Mine. Storke and his partners organized a firm known as the Cabarrus Gold Mining Company. Undoubtedly, this mining activity at the Phoenix led to prospecting and mining at the Furniss but records are void of who may have initiated this action. In 1853, the property owners, George and John Barnhardt, conveyed 156 acres to the Vanderburg Mining Company, a northern corporation. 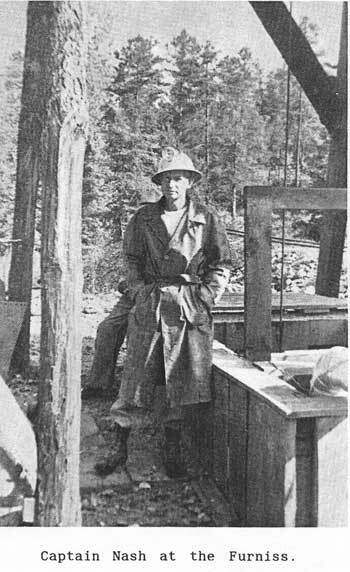 This company commissioned James T. Hodge, a mining engineer, to inspect the mine - then known as the Vanderburg Mine - and to report his findings to company officials. Hodges' report, dated in 1853, stated that the mine at that date had a shaft 100 feet deep with 176 feet of lateral workings. The fortunes of this company were not good, and after only one year of operations, judgments against the firm resulted in a foreclosure sale. William P. Furniss of New York City was the purchaser. The mine thereafter was to be known as the Furniss Mine. Mr. Furniss promptly formed another company, the Excelsior Gold Mining Company and petitioned the General Assembly of North Carolina for a Charter of Incorporation.This was approved and ratified on February 16, 1855. Records are vague, but periodic work probably eontinued until the outbreak of the Civil War. Presumably, it was during this period that chilean mills were erected at two sites on the property. One mill was erected on Plum Run and the other on the upper head of a draw near the Furniss shaft. About 130 years later, the Plum Run Mill was donated to the state by the Nash Family Trust. The mill was moved and reconstructed at the Reed Mine and is now on static display near the entrance to the Visitor Center. The moving of the mill and its reconstruction was done on a volunteer basis by Mr. Bill Widenhouse, assisted by John Dysart, site manager, and site staff personnel. Mr. Widenhouse is a member of the Boardof Directors, Gold History Corporation, and a dedicated supporter of the Reed Mine. The Furniss lay dormant after the Civil War until a brief period of activity in the mid 1870's. At that time, Captain P. L. Fern of New York, directed the sinking of open cuts and two shallow shafts, one about 150 feet SW of the Furniss Shaft and the other on a vein system onthe southward edge of the property. 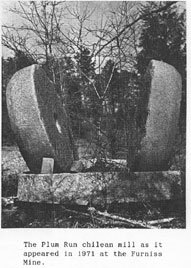 Little is known of the results of this work though the Concord Daily Standard reported on October 26, 1895, that Captain Fern is opening up the Furniss Mine and had struck a rich spot this week". Between 1880 and 1890, the neighboring Phoenix Mine was enjoying its glory era. Under the supervision of Captain Adolph Thies, the mine operated successfully and profitably for a decade. It was at the Phoenix during this period that the Thies Chlorination Process of extracting gold from roasted ore concentrates was perfected. After the Phoenix was closed in 1890, Thies took over the management of the Haile Mine in South Carolina and applied this process on a much larger scale. In 1900 the Phoenix was again operating under the ownership of the Miami Mining Company, a Chicago based company, but chartered in West Virginia. This company also obtained control of the Furniss Mine by a lease agreement. The Furniss Shaft was deepened to 175 feet by 1904, and 324 feet of lateral works had been blasted out at this lower level. Ore from the Furniss was processed at the Phoenix mill. Miami Mining Company, ceased operations at the Phoenix and Furniss Mines in 1907. Both mines were destined for dormancy for decades. The ravages of time and neglect took their toll. Machinery was scrapped or removed. Buildings and houses were dismantled or rotted down and the upper parts of the shafts collapsed. The mines filled with water and nature began its process of reclamation. During the years of World War II, Archie L. Nash, Sr., a veteran prospector and small mine operator, began searching in the Piedmont area for tungsten, a strategic metal that was in short supply and high demand. He found that some of the old gold mines lying west of the Gold Hill Fault Line had promising showings of scheelite, a tungsten mineral, in the waste rock and tailings from former operations. Based on these findings, he purchased the Cline Mine located about four miles north of Mt. Pleasant in 1945. 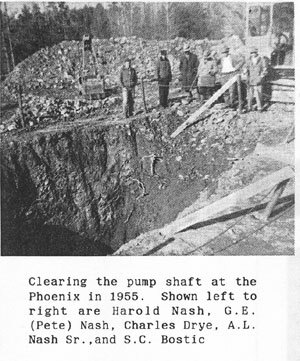 In early 1947 he and a son, Robie L. Nash, in joint ownership, purchased the Furniss Mine and in 1951 Mr. Nash secured a long term lease on the mineral rights of the Phoenix Mine. The Furniss Mine became the focus of renewed activity in 1948. A company, the Nash-Moore Mines, Inc., was organized for the purpose of dewatering the Furniss Shaft for an evaluation of the tungsten and gold content of the exposed underground veins. Personnel from the U.S. Bureau of Mines also carried out tests and evaluations, with particular attention directed to the tungsten content of the ores. Later the Bureau sent in drill crews and eight core drill holes, totaling 1,022 feet, were put down on extensions of the Furniss veins systems. Other than minor amounts of prospect work, a moratorium on mining activities prevailed for the next seven years. On January 7, 1955, the signing of a contract between the Nash interests and the Russell Company of Washington, D.C., later to become the Carolina Tungsten Mining Company, set into motion one of the last major underground mineral exploration ventures in Cabarrus County. Funding for this work was provided by private and government sources. For the second time in the long history of the two mines, the Phoenix and Furniss were under the control of the same company and for exploration and mining purposes were one and the same. On January 10, 1955, Gilbert E. (Pete) Nash was appointed mine captain with full supervisory responsibilities for the rehabilitation of both the Furniss and Phoenix mines. The title, Mine Captain, is synonymous to that of superintendent or supervisor and is of Cornish origin. Thus, Captain Nash joined the ranks of men who contributed much to the mining history of North Carolina. A far from complete list would include Captain John Wilkes of the Capps Mine, Captain J. C. Mills of Burke County, Captain Jones of the Keystone Mine, Captains Moyle, Martin and Peters of the Gold Hill Mines, Captains Hause, Orchard, Morris, Slocum, and Thies of the Phoenix Mines, and Captain Carson of the Rudisil Mine, to mention just a few. Captain Pete Nash is the lone survivor of a host of men who have held this title at the mines of North Carolina. He is still active and is a long time supporter of Reed Mine activities. 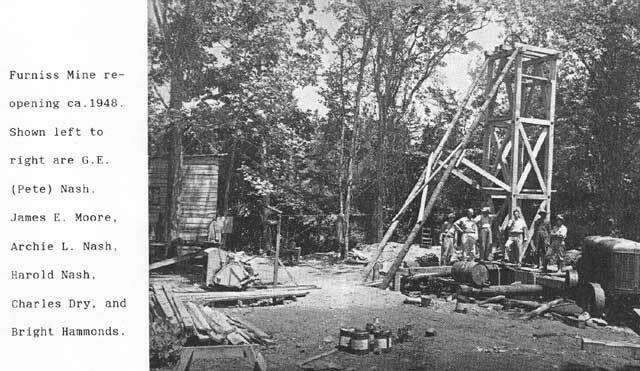 The major objectives of the Carolina Tungsten Mining Company were to dewater the Phoenix and evaluate the known gold ore reserves in the mine and to ascertain if commercial grades of tungsten minerals existed in the ore bodies; secondly, to dewater the Furniss and extend the 175 foot level in both directions to determine if additional tungsten ore similar to that found in the 1948 project could be developed. These objectives were not easily carried out and the tasks involved a considerable amount of expenditures. Captain Nashís immediate target at the Phoenix was to restore the two main shafts, each 600 feet deep, into operating condition and to dewater the mine. This entailed the employment of personnel, acquisition of equipment, opening up access roads, installation of an electrical system, erection of buildings, retimbering of shafts, erection of headframes and the installation of pumping and hoisting equipment. The Phoenix, like the bird of legend, was, after 48 years rising from its ashes. By July of 1955, pumps had lowered the water in the mine down to the 250 foot level. By the middle of December, 1955, the shafts and more than 5,000 feet of lineal underground workings were cleared of water and all accessible areas evaluated by company officials. Additionally, geologists from the state and federal agencies studied and evaluated the ore veins and the underground geology of the mine. With these tests concluded, the pumps were pulled from the shafts but most of the installed surface equipment remained in place. It was the intent of the company to resume operations at the Phoenix when the planned work at the Furniss was completed. As events turned out, this never occurred. The work plan at the Furniss was to rehabilitate the Furniss Shaft, dewater the mine and to extend the 175 foot level in both directions, northeast and southwest. In January 1956, the necessary preliminary work to accomplish this was completed under Captain Nash's direction. Considerable delay was encountered by the necessity to enlarge existing drifts to accommodate the underground equipment. Finally, these obstacles were dealt with and track was laid, water, compressed air, and ventilation pipes installed and drilling began in February, 1956. Jack-leg drills and tungsten insert bits were used with a 315 cfm diesel compressor supplying the air. The normal routine for moving ahead in a drift was to drill sixteen patterned holes, each six feet in depth, into the heading. The holes were then loaded with dynamite and detonated from the surface at the conclusion of the workshift. Average progression was 5-6 feet. All drifts were 8'x 5'in size. A total of 279 feet of drifting was accomplished on the 175 foot level and 40 feet on the 100 foot level. 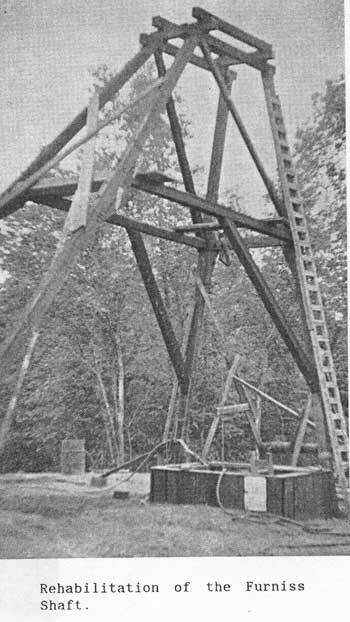 Additionally, a 16 foot station was blasted out of solid rock on the 175 foot level to accommodate a diamond drill machine which was used to core drill a 500 foot horizontal test hole into the footwall zone of the mine. The company did not deem any further work economically viable and discontinued operations in September, 1956. By this time, the government purchase program for tungsten had been terminated leaving a near nonexisting market for the product. Added to this dismal picture was the depressed price of gold. Thenational government in 1956 still controlled the price of gold and the established price was $35.00 per troy ounce. It was not a good time for mining gold or tungsten. Besides these unfavorable external factors, the company's exploration programs failed to delineate new ore bodies of economic value, especially in regard to tungsten. For gold, the evaluations were more optimistic, particularly at the Phoenix. Underground tests confirmed that a substantial amount of developed ore remained in place between the 250 foot and 600 foot levels of the mine. Various engineering estimates of tonnage developed and ready to be mined ranges from 10,000 to 40,000 tons. Average assay values for this ore was estimated to be .80 ounces per ton. The best ore was found on the 600 foot NE level where about 200 lineal feet of vein averaging 20.5 inches in width had an average assay value of about an ounce per ton. Thus, another chapter of the mining history of Cabarrus County was concluded. Unlike some mining ventures of the past, that were fraudulently conceived and operationally directed by persons incompetent in the field of mining, the program at the Furniss and Phoenix in the mid 1950ís can be characterized as one that was executed with a high degree of expertise and professionalism. The company was 100% controlled by a small group of owners, all with impeccable professional reputations. The on site mine force, headed by Captain Pete Nash, undertook a major and difficult and dangerous task in the rehabilitation and exploration of these two old mines and completed these tasks in a safe, timely, and cost effective manner. Today, the Furniss Mine and its richer neighbor, the Phoenix, rest in peaceful solitude. Only a few individuals know and understand their past. Some say that neither will, ever again, be tapped for their resources. Only time will tell. Rehabilitation of the Furniss Shaft.